Seckford Foundation disown Callaghan but should they withdraw the Beccles Free School bid? This is the third in a series of blog posts about Tony Callaghan one of the original four proposers and spokesperson for a time of the Beccles Free School. You might want read the first and second parts if you have not already. Since I published the second post about Beccles Free School a grammar school education "just for middle class children the Seckford Foundation have issued a statement clearly disassociating themselves and disagreeing with the views of Callaghan. 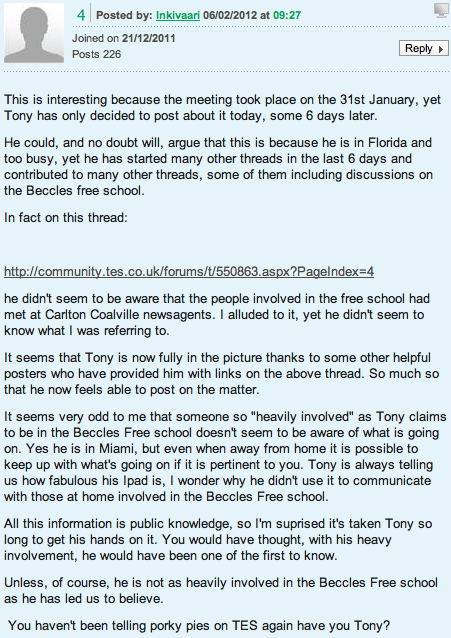 Thank you for drawing to my attention the utterances of Tony Callaghan on the subject of free schools. Mr Callaghan is not known to me, but I understand that he was involved with the Beccles Free School proposal in its early stages. He ceased to have any involvement around August last year and I am told he now lives in Canada. We are absolutely appalled by Mr Callaghan’s comments; they do not remotely represent the views of the Seckford Foundation and we wish to dissociate ourselves entirely from them. The aim of the Foundation in supporting Free School proposals in the county is to support the principle that children and their parents should have a choice in where they are educated, where there is a sufficiently strong desire for such a choice. We have consistently made clear that if, contrary to our understanding, the desire is not there, then we will have no wish to impose a free school on the community. In their statement Seckford Foundation say We have consistently made clear that if, contrary to our understanding, the desire is not there, then we will have no wish to impose a free school on the community. For some time whilst they were collecting this demand a leading member of the free school team has clearly been deceiving parents and providing a misleading impression of the situation in local schools that seems to be based more on his personal prejudice than reality. As such these expressions of interest appear tainted and suspect. Add to that the change of location and I think there is very real doubt that the demand is there. There is yet another strongly worded letter in the Beccles and Bungay Journal this week and it seems genuinely difficult to find supporters of this school - which isn't the case with many of the other bids. Mark Bee the Leader of Suffolk County Council and a local councillor has signed the petition against the school as have hundreds of other people. I call upon the Seckford Foundation under these circumstances to withdraw their bid for Beccles in this round of applications. If they still feel that there is sufficient demand then I would suggest they undertake a completely new and untainted consultation and expression of interest process. And pragmatically it would make most sense to do this for 2014 to avoid the need to move at considerable cost and inconvenience from the temporary site at Carlton Colville. Indeed Seckford Foundation risk alienating the Carlton Colville community as well as many in Beccles as the Town Council are holding a meeting on 3rd March to discuss options and the they are understood to favour using the site for a Library and maybe a post office, CAB and other community functions. I also feel that the Seckford Foundation and Tony Callaghan still owe all the local Headteachers and Jeremy Rowe in particular an apology.